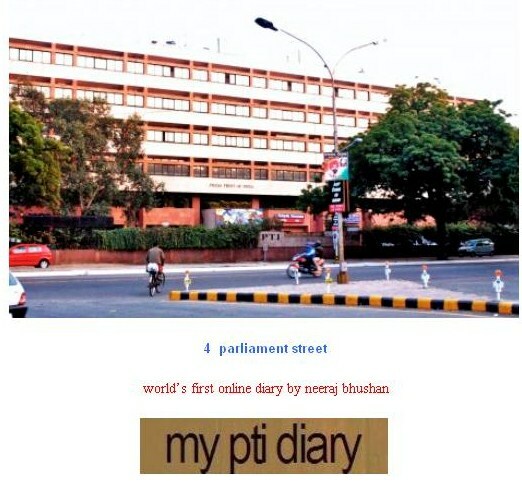 It was on December 1, 2009 that I decided to write ‘PTI Diary’ — a chronology of my experiences at news agency Press Trust of India. Postings started from that week only, when I started joining the dots every Sunday evening. First hand accounts are vivid and I also have plenty of related documents and photographs. These helped me to substantiate my notings. Feedback, comments and support started pouring in thereafter. Threats followed too. And some of the views that travelled to me were even mightier than mine. Initially I was hesitant to start my PTI Diary titled ‘4 Parliament Street’ but my belief that I always carry a greater responsibility, made me reach up to people online… especially when my physical contact with them had been made greatly difficult. However, resource crunch stopped me from continuing with the diary postings in or around May 2010. Since then I was not able to update the page that was meant to be the ‘World’s First Online Diary’. Writing has always been part of my resistance but the situation became too choking. Now, I’ve decided to carry on with the contents and give a new shape to my experiences, in the form of a book. As such ‘PTI Diary’ has to go offline, until new arrangements are chalked out with the would be publisher. Yes, I’m taking this decision with a heavy heart. “Great read, Neeraj. Very few people have the courage of conviction to carry on with the crusade to change the system the way you do. I don’t even have the courage to ask you to ‘keep it up’. Thank you all. Thank you so much. I would indeed miss the regular readers of PTI Diary. This parting from you is not commercially-guided. It’s painful rather. But I would definitely say that our association would continue to grow and God willing we’ll see the morning that we are promised by Him. Remember… truth can never be tamed… truth can never be defeated… truth can never be won over. Be the truth, speak the truth, defend the truth. Make truth your weapon, a powerful weapon. Thank you once again. i believe you have not succumbed to the pressures to shut down the famous pti diary for its employees who are still speechless, afraid and tortured by its federation mafia. I hope you get rehabilitated in the organisation after winning the case in labour court. good luck.